If you want to do some laid-back browsing in Microsoft Edge, consider using the Reading view. It makes it easier to find what you need. And once you do, you can add a page to the Reading List for future viewing. 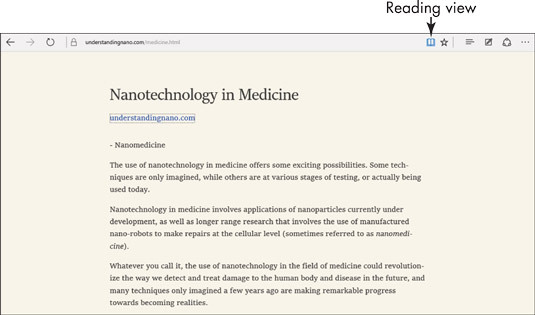 Microsoft Edge’s Reading view provides a more comfortable, clean way to view a web page. 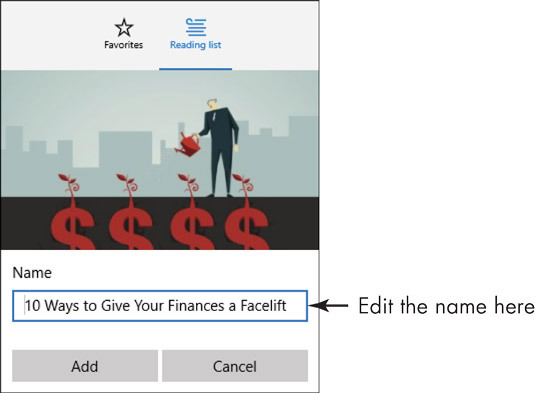 It reformats page text to be narrower, offers larger font size, and removes distractions such as navigation links and ads. To change to Reading view after starting Microsoft Edge and displaying a page, click the Reading View button (with the book on it) toward the right end of the address bar in Microsoft Edge. If the Reading View button is grayed out (disabled), the current page has formatting or other elements that prevent it from displaying properly in Reading view. The page displays in the Reading view. You can move your mouse pointer to the right edge of the screen to display the scroll bar, and then scroll down and up as needed. Click the Reading View button to return to the regular view. You can add a web page to a reading list in Microsoft Edge so that you can come back to it at a later time. Open Microsoft Edge, go to a news or information website, and then click the link to the article that you want to read later. Click the Add to Favorites or Reading List button (with a star on it) on the address bar. In the dialog box that appears, click Reading List. Edit the Name for the reading list item, if you want. Microsoft Edge stores all your reading list items and favorites in the Hub. Other browsers store marked pages in a Favorites list or Bookmarks folder.